John Deere and AGCO Corp. are poised to generate solid stock returns in the long run. The agricultural sector faces a daunting challenge today: To produce enough food to feed a global population that is projected to grow to 9.5 billion by 2050 even as the amount of arable land shrinks. Estimates suggest agricultural output will have to double by that year to meet the incresed demand for food, fiber, and feed. John Deere's largest 9R/9RT Scraper-Special Series Tractor, launched in April 2015. Source: Company website. Needless to say, maximizing crop yields and farm productivity will be crucial, which is why companies that manufacture farm equipment such as tractors, harvesters, and sprayers will play an increasingly important role in bringing food to our table down the line. In other words, farm equipment manufacturers have huge growth potential ahead, and hence make for great investments for truly long term investors. Here are two best farm machinery stocks to put on your radar. Deere is one of the most iconic American brands, having been around for more than 175 years. While its leadership position in the global farm equipment industry gives Deere strong pricing power, innovation has helped the company grow by leaps and bounds worldwide. Today, Deere generates nearly 40% of its total equipment sales from markets outside the U.S. and Canada. Not only does it possess a fantastic brand, but Deere is ambitious: It aims to generate more than 50% of its sales from international markets by 2018. That's a solid strategic plan, because the real opportunity lies in developing countries where farm mechanization is still in its nascent stage. Industry experts expect China, India, and Brazil to lead the demand for farm equipment in the near future. Deere has already laid the groundwork toward its goal, having set up seven new factories across India, China, Brazil, and Russia over just the past couple years. Growing demand for farm equipment is reflected in Deere's numbers: Its revenue and net income have risen steadily over the past five years. DE Revenue (Annual) data by YCharts. Last year was challenging, with low crop prices hitting farm income and hence demand for large farm equipment that also happens to be Deere's largest revenue-generating segment. Yet, Deere reported its second-best profit figure in history, roughly $3.16 billion. Management's vision through 2018 targets $50 billion in net sales assuming midcycle growth, which would translate into compound average growth of 9% from 2010 to 2018. There aren't too many companies around that offer estimates extending beyond a year or two. Deere's financials present an equally solid picture. The company earned $1.4 billion in free cash flow over the past 12 months, and it currently sports an operating margin of roughly 14% and a return on equity of 27%. Last year, Deere increased its quarterly dividend by an impressive 18%, marking the 12th such increase over the past decade. Over this period, the company has paid out more than half of its operating cash flow to shareholders in the form of dividends and share repurchases. Such solid fundamentals are, of course, one of the major factors why Warren Buffett's Berkshire Hathaway upped its stake in Deere during the fourth quarter, fueling investors' optimism. 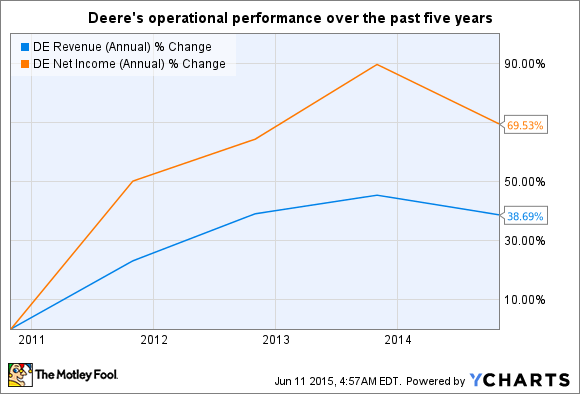 Having underperformed the broader market over the past year, Deere actually looks compelling. As fellow Fool Bob Ciura pointed out, the stock is trading near five-year lows in terms of P/E and yielding dividends at a near five-year high. How many more reasons do you need to give this fantastic stock a look? AGCO might not be as big as Deere, but it has a great competitive advantage over the giant: AGCO derives 75% of its sales from international markets today, with tractors accounting for a major chunk of sales. Graph source: AGCO Annual Report 2014. Naturally, AGCO is well positioned to capitalize on the growth in demand for mechanized tractors and other equipment from developing markets. In fact, greater exposure to international markets is one of the reasons the company has increased its revenue and net income at a higher clip than Deere over the past five years. Take a look. 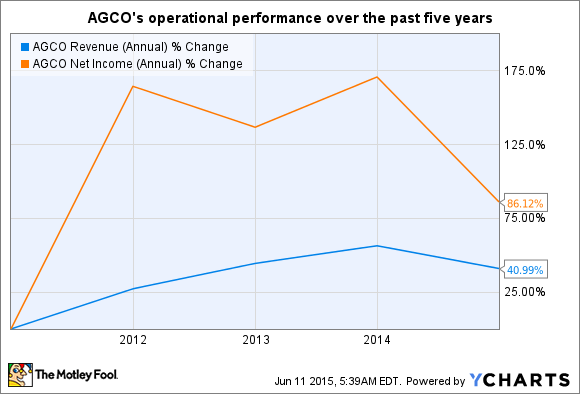 AGCO Revenue (Annual) data by YCharts. The trend should continue, as AGCO is expanding its dealership network and localizing production of high-horse-power machines in key markets including Brazil, Russia, and Africa. The company plans to invest 3.5% of its sales in research and development this year, similar to last year, despite a challenging business environment. Meanwhile, AGCO aims to increase its free cash flow to $300 million in 2015 from $137 million last year, backed by better inventory management and lower costs. In response to weak crop markets, AGCO downsized its workforce by 9% last year. Investors can expect part of the incremental cash flow to go into their pockets: AGCO raised its quarterly dividend by 9% in the first quarter after boosting it 10% early last year. Remember, the company only started paying out a dividend in 2013. AGCO also announced a fresh $500 million stock buyback program in the fourth quarter after wrapping up a program worth the same amount last year. With analysts projecting AGCO's earnings to climb by 9.5% over the next five years, the stock looks like a good bargain. Farm equipment is a cyclical business that is subject to the vagaries of crop prices and farm income. As such, Deere and AGCO earnings could be volatile in the near term. But in the longer run, both stocks look like potential winners.